Budnick Converting, Inc. is a private woman owned corporation. We specialize in converting adhesive coated tapes, foams, films, foils, and other specialty materials from every major manufacturer. Our wide range of services includes slitting, spooling, die-cutting, printing, laminating, waterjet, laser, and XYZ-axis plotting. These services allow us to customize material to your particular application. Budnick also serves as a toll converter, slitting and cutting materials you provide to your desired specifications. At Budnick, it is our mission to consistently deliver timely, innovative solutions that create profit generating value for our business partners, and distinguish Budnick as the obvious choice for quality adhesive tapes and converting services. Our goal is to save you sourcing time, lower your material costs, engineer time-saving processes, and enhance the value of your final goods. Budnick's Business Development Specialists average over 20 years of industry experience. They utilize their expertise to help your team source the optimal tape or adhesive material for your process. They can assist you in the cost-efficient engineering of parts, convert your material to exacting tolerances, and implement cost saving methods. We are a customer focused organization. To fully understand your needs and drive value to your company, we partner to learn your business, your job function, and each and every individual application. Our success depends on making each of our customers more profitable. Ed "Bud" Schwartz and Nick Cutlich founded Budnick Supply Company in 1952. The company began as a distributor of tools and accessories. Bud quickly bought out Nick and took over operations of the enterprise. The product line soon grew to include janitorial supplies and adhesive tapes. In 1982 Bud's daughter, Ann, took over operations of the company. In 1986, we purchased our first lathe slitter to cut custom widths of adhesive tape rolls and quickly created a niche market in specialty converted adhesive tape products. To more accurately portray this metamorphosis of Budnick into a specialty converter of tapes and flexible materials, we changed the company name in 1994 to Budnick Converting, Inc. In 1997, we built our current Headquarters and acquired the surrounding land in Columbia, IL. Today, Ann's daughter, Christy Hornacek, is actively involved in helping Ann manage Budnick's growth and direction. They are contributing to the continued tradition of a family owned business that reinvests in the company, hires good people, puts them in a position to succeed, rewards their effort and empowers them to take initiative. This philosophy created many long-term associates that are truly dedicated to performing at a high level and taking great care of our many valued customers. Budnick is headquartered in Columbia, IL - within the St. Louis Metropolitan Area. The majority of our inventory and manufacturing operations originate from the Columbia facility. We maintain a second converting facility in Tampa, FL, and a warehouse in Oklahoma City, OK. Also, we have partnered with PAE of Mexico on the joint venture Excelcuts, a full service converting company located in Monterrey, Mexico. 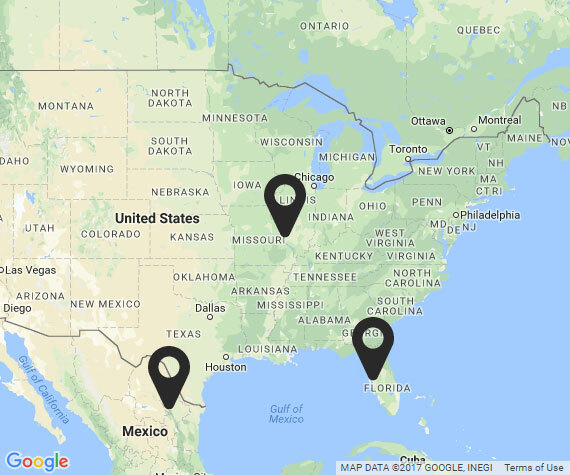 These locations, in addition to our five nationwide sales locations, make it easy for our business consultants to visit manufacturing facilities throughout North America. Our goal is to solve your adhesive problems and engineer the process of applying your tape in the most efficient manner possible. Many of the major tape manufacturers are forming strategic partnerships with Budnick. Due to the combination of adhesive tape manufacturing expertise and Budnick's extensive converting capabilities, tier suppliers, OEMs and end users in many market segments are benefiting from increased productivity in their use of adhesive tapes. As a result, Budnick has become a trusted business partner for all of the major adhesive tape manufacturers and many Fortune 500 companies. Budnick is a 3M Preferred Converter, tesa Net Partner, Avery Advantage Converter, Saint-Gobain Master Converter, and authorized converter for every major adhesive tape manufacturer. Budnick is also a former Better Business Bureau Torch Award winner and is consistently named one of St. Louis Post Dispatch's Top Work Places. Budnick Converting is certified as a women's business enterprise through the Women's Business Enterprise National Council (WBENC), the nation's largest third-party certifier of businesses owned and operated by women in the US. Budnick has been woman-owned since 1982, when the current owner, Ann Wegmann, took over operations of the company. Ann was instrumental in leading Budnick into the Converting industry and continues to be an integral part of Budnick’s day-to-day operations. She led Budnick to be awarded a Better Business Bureau TORCH Award for Outstanding Business Ethics in 2011. Ann’s daughter, Christy, began working for Budnick in 2008. Christy is currently Budnick’s Quality Manager and has been vital to Budnick’s continued success. Click here to see a copy of Budnick's WBENC Certificate. Budnick has been in business for over sixty years, and with over fifty converting machines, we have the broadest and most technologically advanced adhesive tape and flexible material converting capabilities in the industry. With a reputation as the adhesive material converting experts comes a commitment to quality. Budnick’s dedication to quality assures customers that their order will abide by a strict set of guidelines that enable Budnick to be ISO 9001:2015 certified. To view our ISO Certification, please click here. Budnick’s commitment to ensuring you receive quality products and service is second to none. However, issues may arise that need improvement from time to time. Budnick’s Quality Department created the Budnick Converting Inc. Quality Policy and implemented five quality objectives to help prevent future issues from occurring. We will establish and communicate our mission for the organization. We will foster the behavior of all parties to achieve our mission through our leadership. We will involve our people in the organization’s development. We will utilize their knowledge and experience, recognize their contribution, and provide an environment in which they are motivated to realize their full potential. We will listen to our customers to understand and meet their needs and expectations. We will work together with our customers, employees, and suppliers to ensure satisfaction. We will take a process approach towards achieving the organization’s objectives. We will provide an environment in which every person is motivated to continually improve the efficiency of our products, processes, and our management system. Working at Budnick isn't just finding a job, it's joining a family. With opportunities for a broad range of work, we look forward to bringing new people onto the team. Click here to view current opportunities at Budnick.